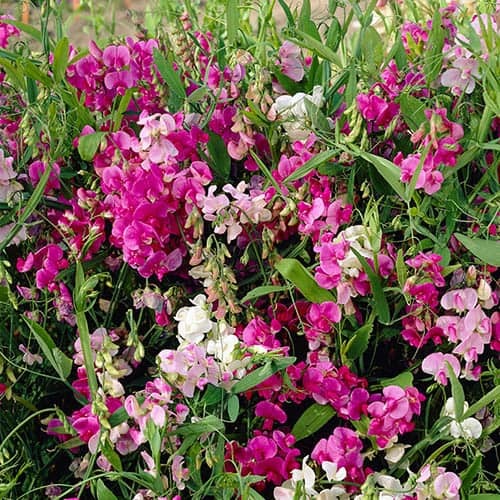 A perennial sweet pea with masses of bright blooms year after year. Enjoy wave after wave of beautiful flowers from early summer and into autumn, this everlasting sweet pea is smothered in sweet-pea blooms year after year. A vigorous, perennial climber, the perennial sweet pea likes nothing better that scrambling over walls and through trees and shrubs. Fully hardy and robust, plants are super-easy to grow and will illuminate the gloomiest of corners in your garden. Adored by butterflies and bees, sweet peas will encourage a whole host of pollinators into your garden. Supplied as a collection of 3 plants in 9cm pots, ready for planting, you'll get 1 each of Lathyrus latifolius 'Pearl', 'Red' and 'White', each growing to approx. 2m x 2m. There's nothing quite like the sight of sweet peas in the garden in summer and with wave after wave of their beautiful and distinctive pea-flowers, each of these delightful plants will burst into bloom from early summer. While annual sweet peas last just one season, these hardy perennials return year after year and are also known as everlasting sweet peas. They are really easy to grow, and prefer a sunny spot, but will also tolerate some shade which make them perfect for those areas that are a bit more difficult for you to get plants to thrive in! The bright colourful flowers which are carried in clusters of around 10 blooms, have an iridescent shimmer to them, making them light up the gloomiest of borders. They're also great in large pots, along with early summer-flowering bulbs, to create spectacular all-round displays! Recommended by the RHS as a Plant for Pollinators, they're adored by butterflies and bees and will attract a host of pollinators into your garden. In this collection you're getting 1 each of Lathyrus latifolius 'Pearl', 'White' and 'Red'. Deadhead faded flowers to encourage more blooms. Perfect when allowed to scramble through rose bushes. Individually knock out each plant from its container. Look at the roots – if they are circling around the compost, it is best to tease them out. To do this, push your fingers into the root ball along the bottom edge and pull. Do this in a couple of places. This should encourage the roots to spread into the surrounding soil. Next use a trowel or spade to create a hole just deep and wide enough to set in the root ball. The aim is to bury just the roots, leaving the bases of the stems (when in growth in summer) or the shoots (in spring) above ground. Angle the plant slight in the direction that you want to set it growing. Maintenance is simple, tie in younger shoots to get the plant on its way upwards and in autumn cut plants back to ground level.